No matter how interesting or innovative your writing might be, a story without three-dimensional characters can quickly fall flat. There are many techniques you can use to add that extra spark to your characters and give them unique qualities that will set them apart from the rest. Human beings are naturally conflicted in the emotions department. Why not translate that reality to your characters? Try pairing your character’s strong belief in a particular ideal with some small cloud of doubt that slowly eats away at his or her perspective. For example: Jon was certain that his girlfriend Dianne was just as much in love with him as he was with her. But ever since Vincent mentioned in passing to him that he’d seen her talking with someone on her balcony late at night, Jon couldn’t help but feel a modicum of insecurity every time he kissed her. 4. Use a character’s physical appearance as an expression of inner feelings. There is a superb literary device known as pathetic fallacy, which uses the outside world to express the inner, and sometimes hidden, emotions of key characters. Try applying this to your character’s physical appearance. Say your main character is struggling with severe depression; he or she may be showing signs of weight loss, disheveled hair, or fatigue. Or maybe your MC is intensely excited; express this by giving his or her cheeks a rosy glow or an impeccable wardrobe to suit his or her pleasant mood. Using physical characteristics to reflect inner emotions will allow you to remind the reader of certain important aspects of a character’s mental state in a more subtle manner, so you don’t overuse internal dialogue or omniscient narration. 5. Draw from your own experiences. 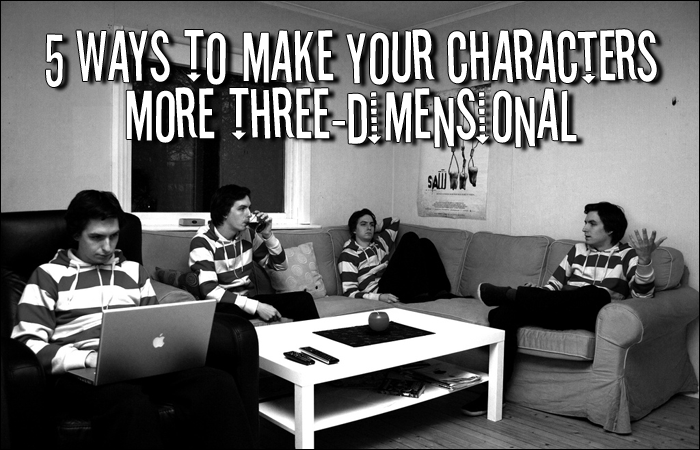 To make a character three-dimensional is to make him or her more believable. What better way to place your character firmly in reality than by using your own life experiences to influence your character’s? Sprinkle your creative narrative with elements of reality so that you allow yourself some distance between your real life and your writing. Maintaining a buffer will allow your work to be accessible to a much wider audience. If your character’s parakeet dies, you can channel your memories of your hamster’s death. The details of the pet species are not important; the human experience of losing a beloved pet can still be transferred to your writing. Remember: Whether writing fiction or nonfiction, you are writing creatively. By following these five simple guidelines, your characters will develop into more dynamic, three-dimensional entities who will not only add believability to your work, but wider appeal as well. QUESTION: Which of these strategies do you use the most, and how has your writing improved as a result? ← What Is Considered Previously Published Writing? Very helpful advice, your examples really demonstrated how to work with each tip. Thank you! Also forgot to say, great article, lots of helpful tips thanks! To the person who spoke of the Star Trek characters Spock and data as one dimensional, with respect I think you’re wrong. Spock is half human, he often struggles between his desire for logic and his human emotions I think it is this duality that makes him so interesting and 3dimentional. As for data, my favourite episodes are the ones where data is taken over by something or something goes wrong in his programming which makes him act abnormaly, sometimes even become evil. And he is always trying to mimic and learn human emotions, charecteristics and behaviour. This is what makes him an interesting charecter, not at all one dimentional. Thanks, Sarah! Good luck with your character’s transformation. I was looking around and found this page. Lots of great tips and such to help me on a current writing. My instructor says i have character that are a cardboard cut out so i am looking how to transform the character in 1000-1500 words. Hardest job ever. David Ho: absolutely. James Wood discusses this in “How Fiction Works.” Both flat and round characters have their roles, but “subtlety of analysis” is what really matters. Unfortunately he leaves us hanging with that abstract assertion. I do have a question. Are there exceptions to making your characters 3 dimensional? Are there times where being one dimensional will make the character more interesting? (2) “Star Trek, the Next Generation”: Lt. Commander Data I think is pretty much one dimensional. (3) “Star Wars”: Yoda, who always has a unique, “wise” way of talking. My cartoon-like character is a guide to my nonfiction picture book learning adventures. Because Little Miss History is based on a younger version of myself, I rely most on my own experiences, but also use physical characteristics to display emotion frequently. I have used the out-of-character technique, which also helps also bring an intesity to the plot sometimes (like when a easy going character loses her temper). But one technique I’d like to try in a more conscious way is giving my characters a belief or sense of destiny. I think it could both deepen characters and make the events and ending more powerful. Great reminders when working on your character development. I’d take it one step further and say that these tips are useful when conveying motivation, another key ingredient to creating believable characters. ya, very relevant and insightful. summed up very important points so briefly, yet vigorously. if the character were to be predictable to the writer himself , right from the start; it would be equally or more so to the reader as well- taking away the freshness of narrative and novelty of situation. These tips are realy good. I have learned many useful ideas from your stuff. Thanks. Great post. I agree with giving characters quirk and making them complex human beings. I also draw a lot from my own experiences to make sure I’m getting the emotions right. 5. So, my work isn’t done, but most of the fun is getting there! I really like the out of character idea. Sometimes you’re so caught up in the story itself that you can struggle with how to make a character super compelling, when really the answer is right in front of your face!